Giving your furniture a facelift can help you start to love it again. 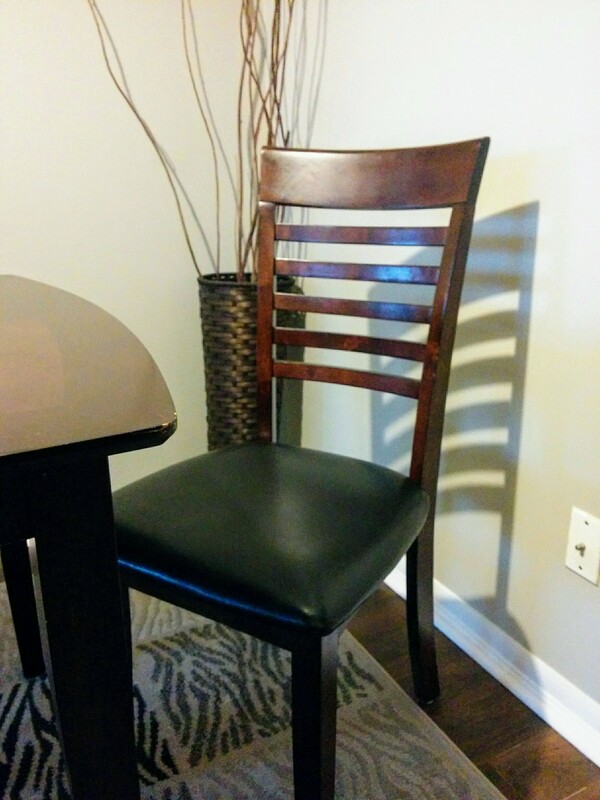 See how I reupholstered these dining room chairs to rekindle my love for this set! Before and after pictures included. I bought this dining set about 5 years ago. The chairs had a vinyl upholstery cover on the seat which I thought was most beneficial for an easy wipe down every now and then. However it had it’s disadvantages, like being really sticky to stand up from in the summer, and the cushioning was on the minimal side, which made sitting for long periods of time uncomfortable. I wondered, if I added more cushioning and changed the fabric, I might be more likely to enjoy sitting at the table more. Last Sunday was cold and rainy, so I decided that I would be productive and reupholster my chairs! In the summertime I had picked up a really nice piece fabric from Fabricland and I had some polyester poly-fil that I wanted to use for extra cushioning. So on that rainy day I didn’t feel like I needed to be anywhere else so I got to work. First you need to take the chair apart dismantling the seat from the frame using a screwdriver. Then take off the old fabric but to do this you need your leaver tool to remove the staples. Discard them safely so that you don’t risk dropping anything on the ground or possibly stepping on them. Lay the seat down on your poly-fil and trace out a generous square to cover the seat. You can use this same sizing for your fabric. Once you’ve cut your poly-fil and fabric begin by stapling the poly-fil to the chair seat then staple the fabric to the seat. If you were able to save the dust cover, then staple that back on top. Finally reattach your chair frame to the seat and voila! I was really happy I chose this fabric colour because I think it adds more character and brightness to my dining room. Now with the extra cushioning the chairs are way more comfortable! I now find myself sitting at the table more for meals, doing other projects or work and even making phone calls! I love my new chairs. With the holiday season right around the corner, I can’t wait to do some entertaining. I know that these chairs will definitely be used a lot!